Barbados is a deservedly world-famous tourist destination. Home to the popular cruise port of Bridgetown, the island has a breath-taking coastline and some of the world's finest diving, surfing and snorkelling conditions. Often referred to as the Platinum Coast, the pear-shaped island's western half is dominated by deluxe beach resorts. The central highlands have some interesting cultural sights (including distilleries and plantations), picturesque villages and some amazing walking and hiking trails. The east gives way to the Atlantic Ocean and is commonly referred to as the 'Soup Bowl' because of its big waves. Surfers and backpackers tend to relish the region's assortment of lively beach-side bars and low-cost accommodation. Barbados's strong ties with English culture have bequeathed it a genial atmosphere and good infrastructure. The sun shines year-round, and the famously friendly locals only enhance the island's glorious ambience. Barbados is rightly one of the most popular winter-sun vacation stops in the world. Barbados is sunny and fair, and can be visited at any time of year. The best time to visit is during the dry season, which runs from January to June - making it the perfect winter-sun vacation destination for travellers from the northern hemisphere. The hurricane season in Barbados runs from June to October, but the island is not generally prone to these natural disasters: visitors will far more likely experience short and spectacular tropical rainstorms during this time. Read more on Barbados' Climate and Weather. - Head to the Platinum Coast, and drink in the sight of the azure water gently lapping at the golden sands. - The scent of tropical flowers hangs heavy in the air in Andromeda Botanical Gardens. - Capture some memories by taking photos of the spectacular coastline of Bathsheba. - Take a tour of the Foursquare Rum Distillery and Heritage Park, located on the site of an old sugar plantation. Read more about Barbados Attractions. - Try your hand at surfing in the Soup Bowl, located on the island's eastern coast. - Get your snorkel gear out and explore sunken ships in the clear depths of the Caribbean Sea. - Socialise with travellers from all over the globe in the backpacker bars that line Barbados's east coast. - Indulge in some authentic island food, such as breaded flying fish and the Barbadian speciality known as 'pepperpot'. Read more about Barbados Activities. 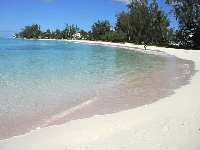 Travellers can find direct cheap flights to Barbados from the US and the UK. Get more information on Barbados Airports. Breaded flying fish, served with spicy yellow sauce made from Scotch Bonnet peppers; and be sure to try a 'pepperpot' (spicy pork stew served in a dark brown sauce), the island's national dish. Drink rum cocktails, and sample the local Banks beer. Haggle with beach vendors for handmade jewellery, colourful fabrics and folk art; and be sure to pick up a bottle or two of the excellent Mount Gay Rum. Pack plenty of sunscreen for a holiday in Barbados, as well as some effective insect repellent. A lightweight rain slicker is a good idea, in the event of a storm. Surfing competitions are held throughout the year in Barbados's Soup Bowl area, on the island's east coast. Witness an island-style cultural celebration at the Holetown Festival, held just north of Bridgetown. The Barbados Food & Wine and Rum Festival is a delight, featuring top cuisine from world-renowned chefs and the best produce from the island's many rum distilleries. - Barbados's Mount Gay rum is the oldest still-functioning rum distillery in the world. - The island's literacy rate is 98 percent. A quintessential Caribbean paradise, travellers to Barbados can anticipate a relaxing, sun-soaked holiday, full of idle hours spent in perfect tranquillity.